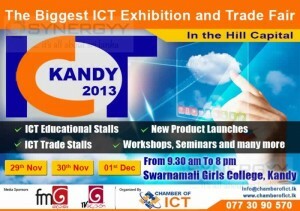 The Information and Communications Technology Agency (ICTA), which implements the government’s ICT policies, will be launching the ‘Free Wi-Fi’ project in partnership with all telecommunication operators, in the coming months, to let citizens have further accessibility to information and participate in e-governance. Thousand public locations will get Wi-Fi free of charge. This has been finalized. 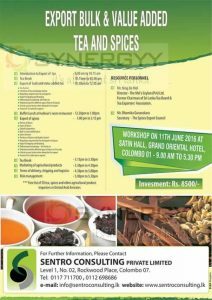 It is not a plan or a promise, because some said it is not economically possible or it was a ploy to get young votes,” Foreign Affairs Deputy Minister Ajith Perera stated to Media. He noted that access to information is no longer a luxury but a critical need, similar to access to water, electricity and telephones used by youngsters in rural villages up to top corporate. This will open up new employment opportunities and new markets may appear. The access points would be fixed at locations of importance, such as universities, public parks, libraries and highly frequented railway stations and bus stops. We are going to implement at 250 locations within the 100-day programme and the rest to follow within two to three months. But our dreams go beyond these 1,000. We want free Wi-Fi to be available everywhere in the country. 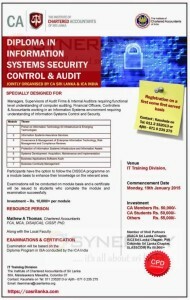 The Institute of Chartered Accountants of Sri Lanka Jointly organised Diploma in Information Systems Security Control & Audit with ICA India. 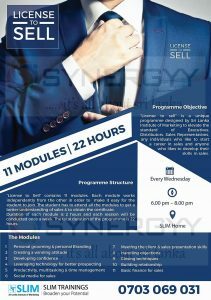 The Diploma programme is specially design for Managers, Supervisors of Audit Firms & Internal Auditors requiring functional level understanding of computer auditing, Financial Officers, Controllers & Accountants working in an Information Systems environment requiring understanding of information Systems Control and Security. 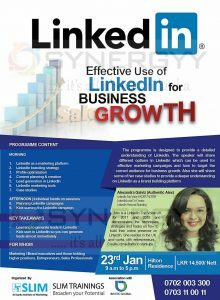 Participants have the option to follow the DISSCA programme on a module basis to enhance their knowledge on the relevant area. Examinations will be conducted on module basis and a certificate will be issued to students who complete the module and examination successfully. Resource Person : Mathew A Thomas, Chartered Accountants FCA, MCA. DISA(ICAI). CISSP. PhD. 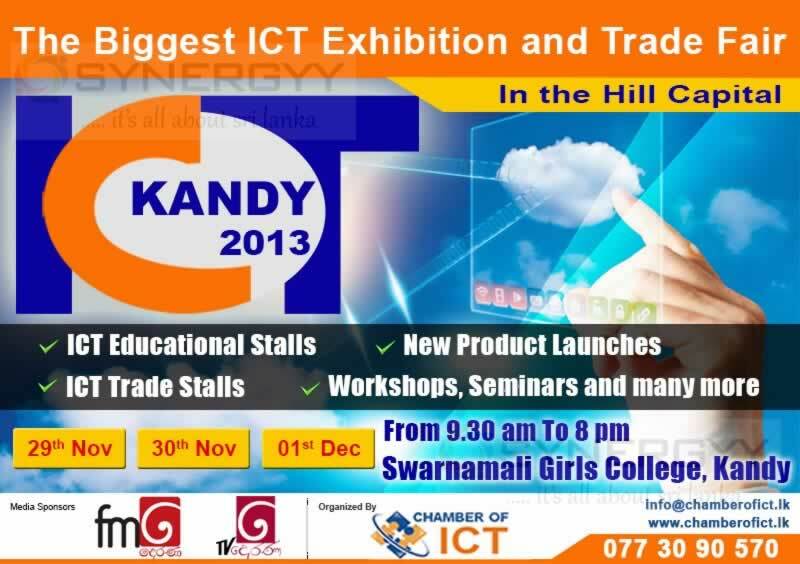 The Chamber of ICT Sri lanka organised an the biggest ICT Exhibition and Trade fair in Kandy on 29th , 30th December and 1st December 2013. 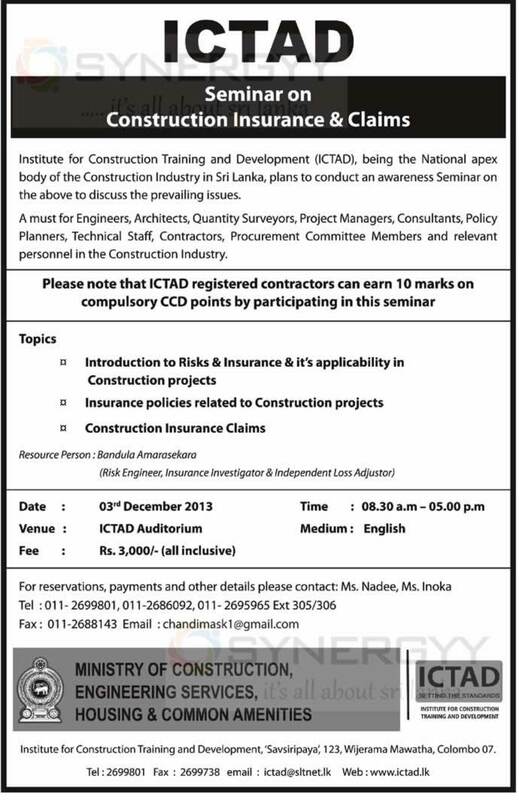 Institute for Construction Training and Development (ICTAD), being the National apex body of the Construction Industry in Sri Lanka, plans to conduct an awareness Seminar on the above to discuss the prevailing issues. 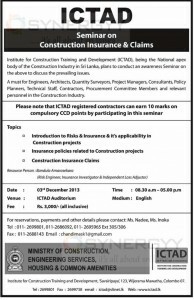 A must for Engineers, Architects, Quantity Surveyors, Project Managers, Consultants, Policy Planners, Technical Staff, Contractors, Procurement Committee Members and relevant personnel in the Construction Industry.